Last Friday we conducted a prescribed burn at Gallagher Creek Park. Located near the headwaters of Gallagher Creek, this park protects our important water resources in our township. Notably, Gallagher Creek is home to a remnant population of native brook trout. 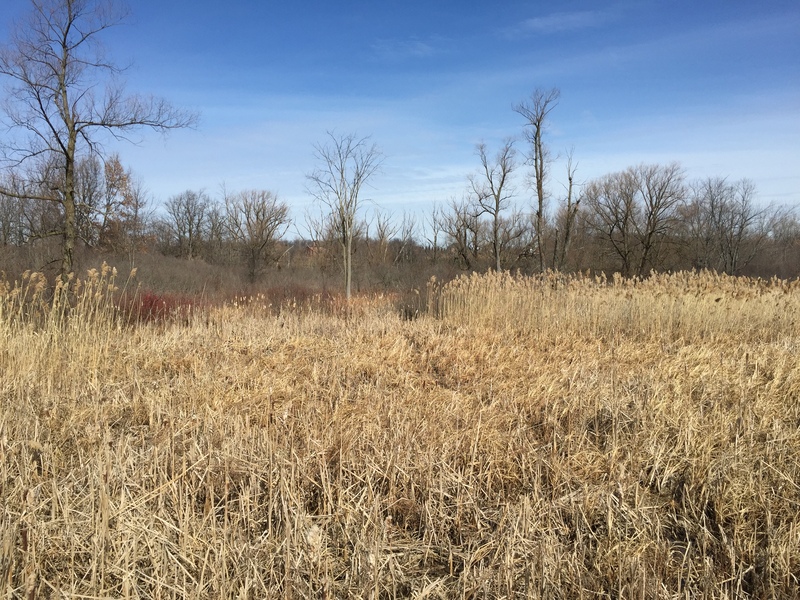 In addition to stimulating the native plant communities at this park, the prescribed burn was part of our Phragmites control program (along with appropriate Michigan DEQ approved chemical control). We hope that managing for healthy native plant communities in the wetlands around the creek will help keep Gallagher Creek itself healthy. The wetlands at Gallagher Creek Park filter pollutants from runoff leaving our roads, lawns, and parking lots before it reaches Gallagher Creek. We are working to control the Phragmites (tall plumed grass in these pictures). Wetlands are natural water filters! Gallagher Creek is a small, coldwater stream originating just south of the Bald Mountain Recreation Area in central portion of eastern Oakland County. It flows in a northeasterly direction and empties into Paint Creek at Orion Road in the Village of Goodison. The creek flows through private land; there is no public access. This stream is home to one of the few remaining self-sustaining brook trout populations in southern Michigan. There were concerns that habitat quality had degraded due to sediment and nutrient inputs from erosion and runoff associated with development in the watershed. A survey in 1998 indicated that runoff from construction sites in the area was responsible for depositing sediment in the gravel riffles and natural pools formerly present in the stream. Previous surveys of this stream in 1990 and 1998 produced brook trout densities of 300 trout per mile. In 1992, mottled sculpin were trapped and transferred from Johnson Creek in Wayne County to Paint Creek as a prey item for trout. The sculpin had managed to expand their populations into the lower stretches of Gallagher Creek by 1998. This survey was conducted to evaluate the status of brook trout in Gallagher Creek. We captured a total of 7 brook trout from 6 to 7 inches and 1 brown trout at 3 inches. The brook trout density found in this survey was about 50 per mile, down from 300 per mile in 1990 and 1998. This decline in abundance is likely due to siltation of the stream from the development along the creek. Mottled sculpin have expanded their range even further upstream from 1998. We also captured blacknose dace during the survey. The presence of these two species indicates that the water quality is still good, but the heavy siltation is hampering the brook trout’s ability to reproduce. Does our natural heritage, a special population of brook trout in this case, need to be sacrificed for the sake development? Or can we be smart with our development, designing systems that protect the stream by filtering runoff to capture silt and other pollutants? Panoramic photo of Gallagher Creek Park after the controlled burn on March 20, 2015. Visit the park later this spring to watch the green return! Wish our DNR was more interested in protecting and restoring this special stream! It was the best kept secret in Oakland Township years ago when only locals fished for brook trout. Very glad to see someone taking care of this stream. This is one of 2 brook trout streams in Oakland co. that I know of. I plan on visiting there tomorrow. Thanks for preserving this stream, I thought it had been forgotten about. So wahts the name of the other brook trout creek? Can either be fished? So wonderful to have native Brook trout in Oakland Township! And it’s good to know the water quality is good and that the remaining problem is the silt. So can we assume that now that the pragmites are going, the native sedge grasses etc. should grow back and do a better job of keeping silt from the stream? And you’d mentioned that the golf course manager was open to working with the township. Would a rain garden on their side of the creek be possible? Great panoramic shot after the burn! We’ll probably need to re-treat any Phragmites stragglers that survived treatment last fall. We’ll keep an eye on these areas to make sure that native plants, not other invasive species, return. If native plants don’t re-establish on their own, we will need to supplement with native plant seed. It looks like the golf course has natural buffer strips along the creek, so we’ll continue to work with them to make sure we protect the creek together. Maybe we could put in a rain garden to filter the runoff from the parking lot at Gallagher Creek Park!